Last weekend, I attended the ninth annual Fantastic Films Weekend at the National Media Museum in Bradford. I had a brilliant time discovering and rediscovering classic horror and Sci-Fi films, but also came across a lovely use of the Classical tradition in the film 28 Days Later. I really loved 28 Days Later when it first came out – in fact, I ended up seeing it twice while it was still in the cinema, which is very rare for me. But I hadn’t seen it again since, so I’d forgotten a lot of the fine detail. It really is a very beautifully-shot piece of film. I’d certainly remembered the early scenes of Cillian Murphy wandering around a deserted London, and found on re-watching that they very much stood the test of time. But I’d forgotten all sorts of other absolutely breathtaking scenes, such as the use made of the rain during the attack-and-breakout scene at the military head-quarters towards the end. I’d also forgotten how much the music adds to the emotional impact throughout – it’s been running round my head all week, and I’ve bought several of the songs from the soundtrack album today. I had remembered how good the characterisation was, though obviously it was still a pleasure to rediscover in detail how well-drawn all of the characters were. The focus on the interactions between a small group of people clinging together in the face of extreme danger makes for some very intensive drama. Plenty of time is given to really getting to know all of the main characters and understanding their feelings and motivations, while the range of their experiences of scary attacks, empty sadness, horrible tension and occasional moments of sheer joy felt really well-balanced to me. The dialogue is just masterful, pushing the plot along nicely where it needs to, but always remaining naturalistic and emotionally truthful. And although it shouldn’t be anything out of the ordinary, the film also deserves credit for presenting a black female character (Selena) in a strong central role – unfortunately still something which is still all too rare in the cinema. The world-building and the settings are very carefully thought through, too. The notices and newspapers which we catch sight of on walls and tables, and blowing around on the floor, are a good example of this. Most of them are never focussed on directly, but the glimpses that we get do so much to evoke what has happened during the 28 days between the break-in at the research lab and the start of the main story. And how clever to set the picnic and overnight stop which they have on their journey north from London in a ruined abbey, with all its evocation of a past way of life brought violently to an end. The same goes for the large country mansion used by the Major and his soldiers. Our aristocracy weren’t violently overthrown in the same way as the monasteries – but they are a thing of the past, while the setting throws up fantastic contrasts between the refined, luxurious world which the house evokes and what we see actually going on there during the film. It’s possible that the statue is a permanent fixture in the stately home where the scenes were shot, since many English country houses do have extensive collections of either original Greek and Roman statues or copies of famous pieces. 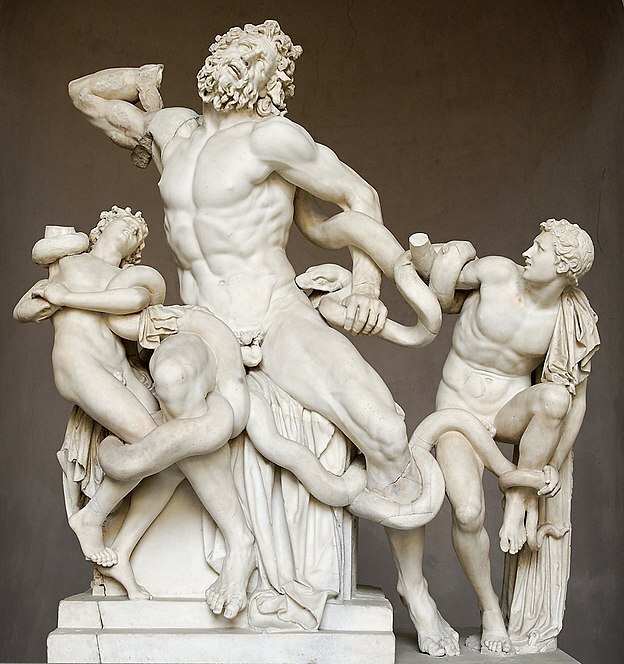 But Googling “trafalgar house” + laocoon brings up no meaningful connection between the two, while the way the light catches the statue seen in the film makes it look rather like it is made of fibre-glass – and thus probably a prop. So I think it is probably a deliberate piece of mise en scène for the purposes of the film – and of course even if it isn’t, the decision to focus on it so heavily in the film certainly will have been deliberate. Debate rages over exactly what Titian himself was trying to say when he made this print. But in the context of 28 Days Later, the existence of Titian’s caricature does help to make a stronger link between the suffering which the human researchers visit on the apes at the beginning of the film, and the suffering which mankind endures as a result. Finally, putting a character from the Trojan war inside a mansion which is under siege by the infected also acts a foreshadowing for how that section of the story is going to end up. As soon as we see it, we’re reminded of the fate of Troy itself, and also prompted to start asking where the Trojan horse is in all this. I think there’s more than one possible answer to that. It could be Jim, Selena and Hannah, whose arrival in the house is greeted joyously by the soldiers – but ultimately turns out to be a disaster for all of them. Or it could be the infected soldier chained up in the yard. I’m not sure it really matters how you answer the question – but the fact that the statue is there to prompt it is just one very impressive example of how thoughtfully crafted this film is. This entry was posted on June 13, 2010 at 16:37	and is filed under classical receptions, films, reviews, roman art, roman literature. You can follow any responses to this entry through the RSS 2.0 feed. You can leave a response, or trackback from your own site. Great post. I hadn’t watched the movie. 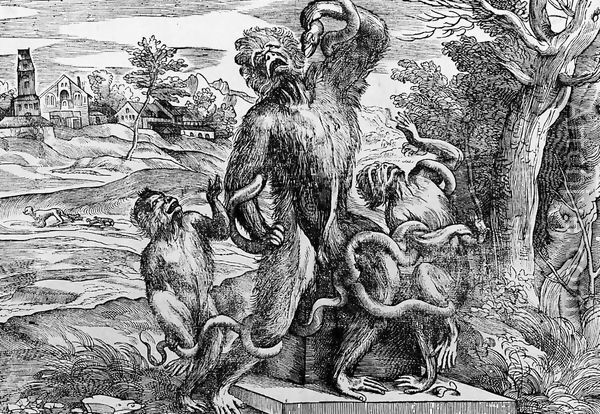 But your writing about the tale of Laocoon and the parallels in the movie make an interesting read. I’d definitely recommend seeing it. It’s pretty scary in places, but if you’re OK with that it is also a really beautifully put-together film with some very uplifting moments and brilliant characterisation. First of all, apologize my english I’m French. – The cold blood of Selena at begin concerning a person that is contaminated (i.e. the scene where she kill her mate I don’t remember his name) and after after the confrontion with Jim a return to humanity –> Jim represents a sort of humanism ? A consciouness ? A rest of humanity ? he woke up from coma, is humanity is sleeping ? – The return to the beast of Jim to save Selena and the girl from other beasts, I mean when he escapes from the execution, he left is T-shirt on barbed wires and then counter attack the mansion, do you have remark he look like “infected” ? Selena does not :) —> What morality ? Do we have to be beasts to fights against beasts ? What’s the message ? At least, all of the background (the world infected by “furor”) is just an excuse to put essentials questions about our society ? I think I have to watch this film another time, and the third time I will focus on the “second reading” of the images. Hi David! Many thanks for your comment, and especially for taking the time to write it in a second language. I’m glad you enjoyed my post about the statue, and I very much agree that this film raises a lot of questions and has many layers of meaning in it. The virus is actually called ‘Rage’ in the English version of the film, but this fits with what you say above very well. It is something which humanity already has – the virus just releases it or exaggerates it. This is definitely a film which can be watched many times, anyway. I love the use of music in it.